There’s trouble in White Pine Bay. A&E’s modern day prequel to the Alfred Hitchcock classic Psycho, which in turn is based on the novel by Robert Bloch, is back for its second season. The season premiere, which aired March 3, picks up after the shocking events of last season’s finale. 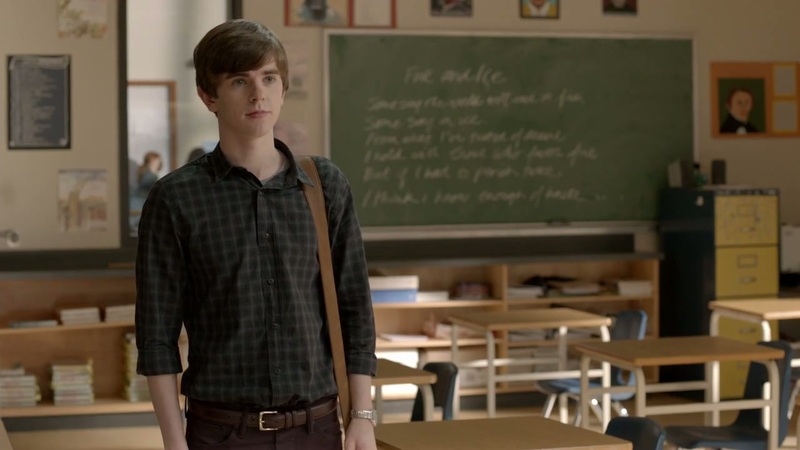 After a quick recap of the major events of the first season, as narrated by executive producer Carlton Cuse, the premiere finds Norman Bates (Freddie Highmore) asleep in bed. He’s troubled with thoughts about Ms. Watson, the young English teacher murdered at the end of season one. Norma Bates (Vera Farmiga) is intensely concerned about her son and seems to start to piece together the gaps in Norman’s account of that mysterious night at Ms. Watson’s house, but she doesn’t quite figure it out. The greatest part of watching Bates Motel remains its persistent elusiveness. Not since Lost have I seen such a multilayered, thrillingly and mysterious show. This likely has something to do with Cuse, who also served as executive producer for Lost. 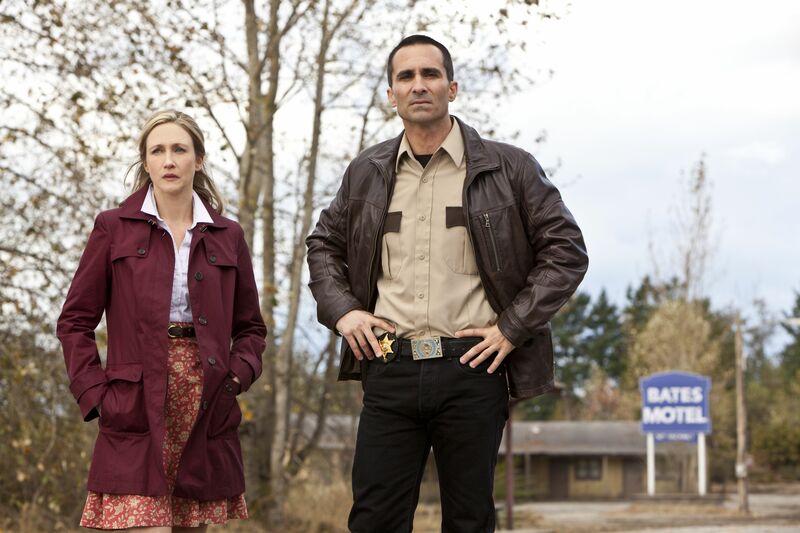 In just the first two episodes of this season, Bates Motel has already crafted an incredibly knotted web of connections between the colorful smattering of characters in the quaint White Pine Bay and has laid the fuses for some potentially devastating consequences. Where the first season of the show was marked by its chilling intimacy, this season is already shooting for bigger, heavier conflict. The motel is finally up and running, and a four month jump sends us from the somber, wet winter to the colorful, shining Oregon spring. The indie rock soundtrack definitely becomes too noticeable within the first 20 minutes of the premiere – oh TV royalties – but thankfully Chris Bacon’s tense, twisted score takes the reigns as the larger moments play out. The broader plot of the first two new episodes is engaging and satisfyingly complex, but the expanded plate this season is not without excess fat. The drug business subplot is dragging, and most of the characters involved, save Norman’s brother, Dylan (Max Thieriot), have become annoying to listen to week after week. As more sinister events unfurl, the show will hopefully lean out and refocus on its more compelling pieces. If there’s one real draw to Bates Motel, it’s the dynamite chemistry between the co-stars. Highmore and Farmiga are fantastically off as Norman and Norma. As the smothered son, Highmore plays Norman with consistently eerie restraint. He’s usually too chipper, too polite and too much of a pushover, but when he gets upset: oh boy. It’s thrilling to see him and Norma square off since Farmiga plays Norma with an equally incredible range. She’s a total loose cannon, ready to explode in the face of anyone who dares threaten her business, or her son. Farmiga is committed to every outburst, every scream and every plea that Norma doles out. It’s more than fair to deem her performance Emmy-worthy. She completely inhabits a character that is her son’s (and her own) worst problem. Norman and Norma’s relationship is the true heart of this show, and the showrunners have maintained the focus on that relationship and its bizarre nature. The Oedipal tension is constant and often adds a heightened sense of danger to every on-screen interaction between mother and son. The weirdness factor makes scenes that would otherwise be dead weight into something worth watching at best, bearable at worst. For example, in episode two, Norma drags Norman into auditioning for a community theater production of South Pacific. After a large fight that nearly derails the whole idea, the two come to terms for the moment. Then Norma sings, and somehow, despite the absurd juxtaposition of her incredible talent (who knew?) with everything else we’ve come to know about the character, it’s completely believable. Bates Motel is off to a promising start this season. The show is in good creative hands, and the core cast is more than delivering week to week. As long as the show stays focused on the compelling development of one of horror’s most notorious characters, there will always be time for another stay. This article was published in its original form in The Massachusetts Daily Collegian on March 12, 2014.